Let me tell you about Alabama. There is a street in my father's hometown of Decatur, up north next to the Tennessee River, where you will find a modest ranch house. In the yard of that house stands the biggest oak tree I have ever seen. Once upon a time, as a boy, I sat in a swing under that tree with my grandmother in the twilight and watched as the lightning bugs came out. My grandmother taught school out of that house for thirty years, and taught me to read and write almost before I could walk. Across the street was Mrs. Jenkins, a native of the Black Belt in south Alabama, with her ancient toy poodle, and when she called to me, I would run over and pick cherry tomatoes out of her garden. My grandmother was a Bible-believing Christian who gave me my first scriptural study, and thanks to her, I know that book backward and forward. She believed everything in that book was, essentially, literally true, she gave herself entirely to charity, and was by far and away the kindest person I have ever known. She could make fried okra and chicken and dumplings that would give stomach rumblings to a statue. She never understood why the men on Austin City Limits had to wiggle around so much when they played guitar, but she didn't like it. She liked just about everything else, though, and loved me with a fullness I could never adequately describe. They are both gone now, my grandmother and Mrs. Jenkins, but the house is still there. So is the tree and, I devoutly hope, the swing. The lightning bugs are still there, too, and I remember all of it. A little ways out of town, out where the countryside rolls to the river, is an old dusty road called, appropriately, Old River Road. My grandfather and his second wife lived there to the end of their days on a hill atop a nice spread of land set back behind a grove of trees. He had two old, fat horses and a Doberman with the size and temperament of an NFL linebacker. I was terrified of that beast all throughout my childhood – it would charge at me whenever my father brought me to visit, and I would climb my father like a monkey – and when I was twelve, the thing took a sizeable bite out of me. The funny part is that, upon my return the following year, the fearsome creature walked up and nuzzled me, asking to be petted. Having established his reign, we were finally able to be friends. My grandfather was a physician, the first board-certified pediatrician between Birmingham and Nashville, but was in every respect an old country doctor down to his bones. In the morning, we would walk past the Cadillac and pile into his battered pickup truck, and trundle into town to get the mail. He gave me a check-up every time I came to visit, a big reflector dish perched on his head, and charted my growth meticulously throughout my first eighteen years. During a phase when I wanted to be Huck Finn, he would take me fishing for catfish. Sometimes, in the evenings, I would walk to the end of his road where the grass gave over to scrub brush, and beyond it, the river. I would sit for hours watching the water roll by, listening to the “reeeeeee” of the cicadas in the magnolia trees. That's my Alabama. Not all of it, though. Not by half. Alabama for me is my lawyer father in his Atticus Finch suit, going to work in the Capitol building in Montgomery. Back then it was still a functioning civic building, and not the museum it is today, and it was the most haunted structure I have ever passed through. I used to swipe root beers out of the refrigerator in the Secretary of State's office, and during one memorable summer, was a page in the House and Senate. I fell in love for the first time in my life that summer with a girl from Scottsboro. I haven't seen her in 26 years, but I still remember every line of her features. The air in Montgomery is so thick with history you have to wave it away from your face. Climb to the top of the alabaster steps leading to the front door of the Capitol building, look down, and you will find a gold star embedded in the stone commemorating the place where Jefferson Davis first declared the Confederacy. Turn around and look across the street, and you will see a tiny church where Martin Luther King, Jr. had his first ministry. 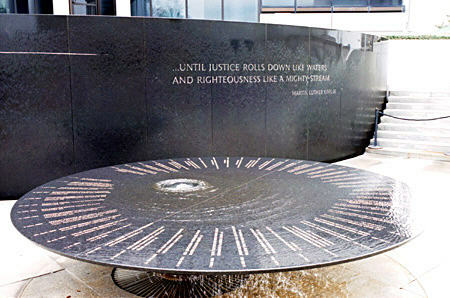 Not far away is the sublime monument to the Civil Rights struggle and those who were martyrs to that cause. Walk a few blocks to the Alabama River and you'll come across an old paddle-wheel riverboat docked and waiting for passengers. My father and I rode that boat every summer, and always enjoyed it thoroughly, except the one year they put a Pac-Man machine on board. All I wanted to do was play the game, but my father wanted us to spend time together instead, and I had a nice little tantrum, because I was a little boy. Decatur, Huntsville, Tuscaloosa, Selma, Montgomery, Birmingham, Mobile…those were the stations of the cross for my father and I when I came to visit. We spent hours and hours on the roads in between, watching the pine forests and red clay and kudzu flash by, watching the hot ripple in the distance make the road disappear. Sometimes there would be rain, rain like a hammer, Alabama rain, like a curtain across the road and then whack! we were in it, no visibility, down to three miles per hour until it would pass as quickly as it came. I remember one such trip when I was wildly into The Doors, and had “Riders on the Storm” on the tape deck. As the music unfolded, my father's knuckles went white on the steering wheel as he told me about watching lightning strike the Mekong Delta from a helicopter during the war. They were playing the same song on a rig in the chopper. When I was a toddler, we lived for a time in a small house in Tuscaloosa. At this moment, I have no idea if that house still exists. The tornadoes took so much, did so much damage, were so horrifically lethal. One of them came unimaginably close to my father's home, and I was frantic until I heard from him. My step-brother has given himself over to the grisly work of recovery and clean-up, and flights of angels will sing his name when he is done. I wish I was there with him, but so many have volunteered to help that they have been turning people away. That is Alabama, too. I am a Boston boy through and through, but the red clay of Alabama is still under my fingernails, and the boy I was is still there, lost in adolescence and memories yet to be. It is a place of singular beauty, my father's home, like his father's fathers before him. He is still there, as is the oak tree, and the rivers, and the old country road. The tornadoes didn't take everything. Alabama, you are in my prayers. We are all your sons and daughters today.